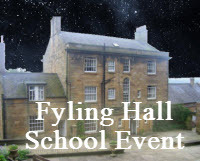 On March 1st we will be hosting an event at Fylinghall School, which is also being co-promoted by Baytown Coffee. It’s 3 years since we last visited the School for a star night event, and it will be nice to renew ties. If conditions are satisfactory (not chucking it down, blowing a Hooley, or knee deep in snow- none of which look likely) the boarding students will be flogged enlisted to help out with a scaled solar system demonstration before observing is commenced, or the implementation of plan B (indoor presentation). The location will be the front lawn of the School (facing the sea) starting around 19:20h. We shall therefore need to be present on site by 19:00h. Assistance with equipment transportation would be very welcome. We'll depart from Mark’s at 18:30h. The event has been publicised in the Whitby Gazette, but further details can be found by contacting Angelique on marketing fylinghall.org.